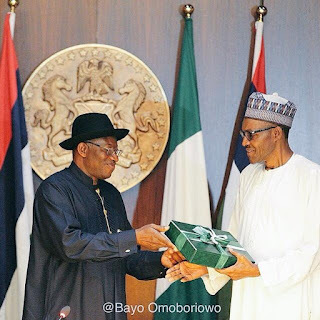 President Goodluck Jonathan on Thursday formally presented his hand over notes to the President-elect, Muhammadu Buhari. The presentation was done inside the Council Chamber of the Presidential Villa, Abuja, shortly after Jonathan conducted Buhari round the seat of power. Vice President Namadi Sambo had also similarly conducted the Vice President-elect, Yemi Osinbajo, round his wing of the villa. Jonathan presented an executive summary of his hand over notes and a copy of the report of the National Conference to Buhari in the presence of All Progressives Congress chiefs who accompanied him to the event. In his remarks, Jonathan said his administration had done its best for the country. Buhari said he would not make a bold statement until after studying the handover notes. He however commended Jonathan for conceding defeat in the March 28 Presidential election. He said the outgoing President could have made things difficult if he wanted to do so.